Manchester United moved up to sixth in the English Premier League table with 48 points. Champions Manchester United rediscovered a touch of their old swagger to beat West Bromwich Albion 3-0 on Saturday and record back-to-back Premier League wins for the first time since December. Phil Jones headed home a Robin van Persie free kick in the first half, Wayne Rooney finished a sweeping passing move with another header after the break and Danny Welbeck added a third to secure the points against a woeful West Brom side. United, whose difficult season was compounded by a demoralising Champions League defeat to Olympiakos in their last outing, moved up to sixth in the table with 48 points. West Brom and manager Pepe Mel, winless since taking over in early January, stay one place above the relegation zone. Leaders Chelsea host Tottenham Hotspur in the big game of the day later on Saturday while at the other end of the table Cardiff City welcome Fulham, Crystal Palace are at home to Southampton and Norwich play Stoke. United manager David Moyes shuffled his pack after their poor showing in Europe, adding a youthful complexion to their defence where Jones was paired with Chris Smalling. For most of the first half the pair looked unconvincing at the heart of the back four as United struggled to find any rhythm or tempo, but at the other end of the pitch Jones made a decisive contribution. 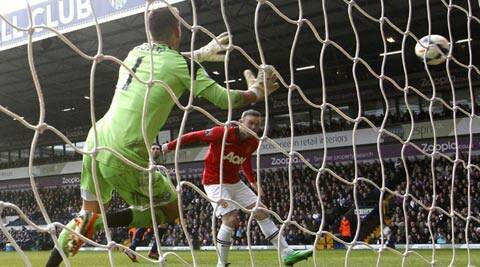 After Rafael had forced United’s former keeper Ben Foster to tip his header onto the bar, Jones opened the scoring by powerfully heading home a Van Persie set piece after 34 minutes. West Brom, who have now won one of their last 19 matches in all competitions, predictably laboured in attack, but looked mildly threatening from set pieces with Claudio Yacob heading over from close range. The second half began with controversy as Van Persie escaped a second yellow card when he slid into a reckless challenge only to receive a final warning from the referee. The more the hosts pushed forward, however, the more they looked vulnerable to the counter and Rooney effectively sealed the points in the 65th minute, heading in a cross from Rafael after a sweeping passing move from the Moyes’s side. United’s exciting attacking talents, who have flattered to deceive at times this season, began to strut like their old selves, with Welbeck finishing off an intricate passing move with angled shot beyond Foster to complete the scoring.